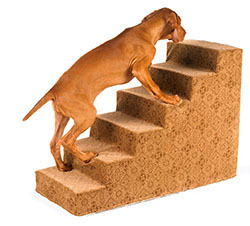 Pet Steps will help prevent injury when an older or disabled dog trys to climb or jump onto furniture. Bowsers Microvelvet zippered covers are durable and easy to clean;, just zip off and wash. The "High Density" foam inner base provides a balance of stability and support. 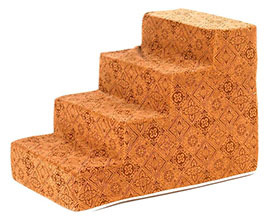 The foam base is easy to move around your home. Cleaning: Remove outer cover, then Re-zip outer cover and machine wash and dry on cool setting. Custom: Please contact customer service for more information. It takes 4+ weeks to ship.